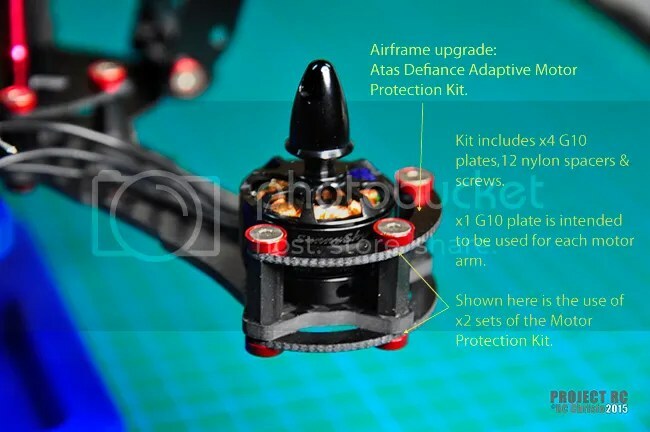 Part 01 of this build articles series is a brief overview of the Atas Defiance 265 class FPV Racing Quadcopter. 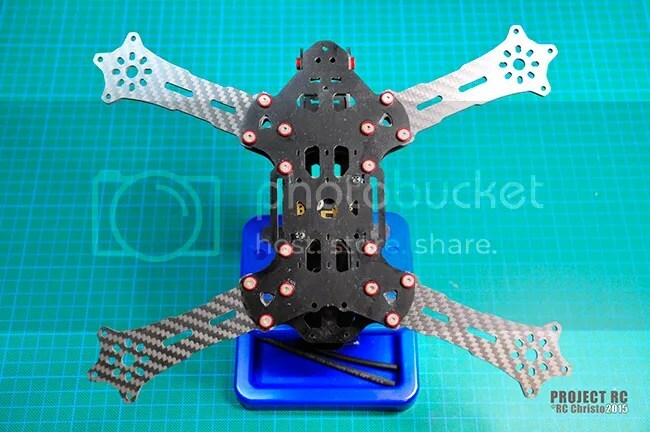 This particular type of RC is new to me and there are many complex systems that make up a complete FPV Racing Quadcopter. This airframe is just one of many elements. This is a learning process and an experiment to understand the full scope of this aerial platform. 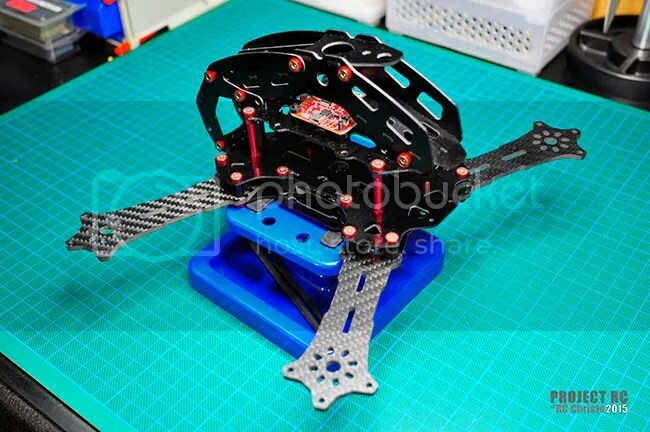 I spent many weeks of rigorous research learning about the vast array of 250 – 300 class racing quadcopter platforms that are available. 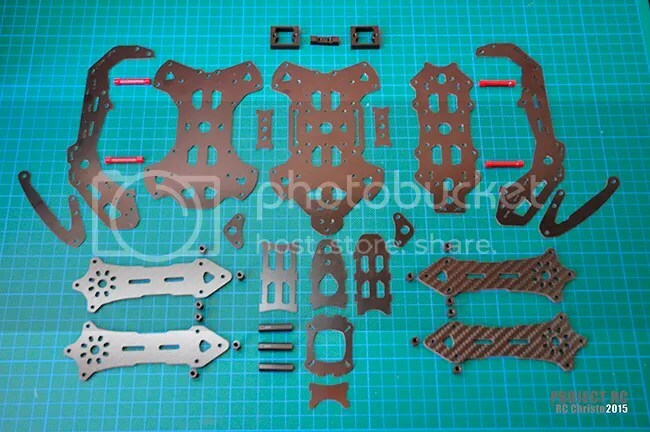 Based on my findings at the time, most racing quad airframes were ‘rectangular box’ structures with chassis plates commonly made from either Carbon Fibre or G10 material structured together with aluminium or nylon spacers. G10 or sometimes referred to as ‘G10 FR-4 or Garolite’ is a thermosetting industrial fibre glass composite laminate consisting of a continuous filament glass cloth material with an epoxy resin binder.Carbon fiber is composed of carbon atoms bonded together to form a long chain. The fibres are extremely stiff, strong, and light which is then weaved and bonded with epoxy resins. 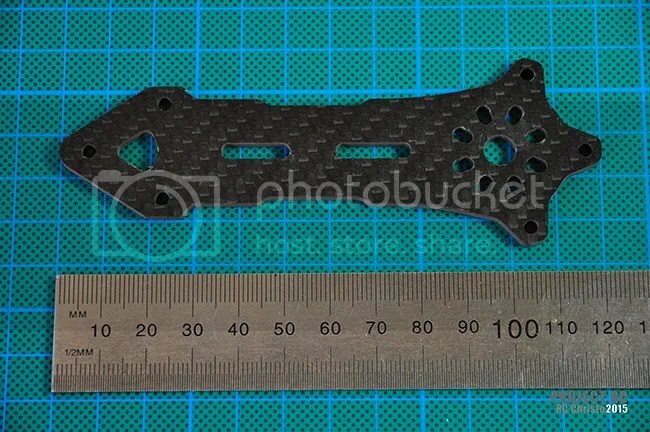 Carbon fibre is more rigid with G10 being slightly more flexible. G10 frames are less expensive than Carbon Fibre, and a key benefit and difference of G10 is that it is non-conductive which means that there is less danger of accidental shorts and also means that it doesn’t block radio signals. When selecting an airframe it is important to consider not just the material but how well the frame is designed. Is the structure sound, are weak points addressed, will the frame fit all your gear. Importantly are components inexpensive to replace. During airframe selection I thought that I had settled on one of the popular airframes on the market which had the ‘rectangular box’ structure, then I discovered the Atas Defiance 265. 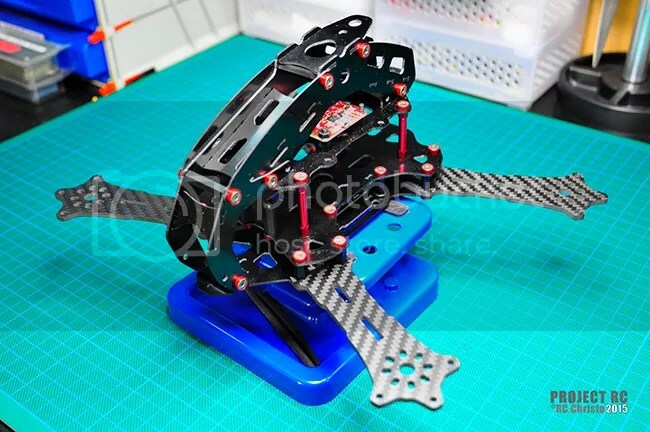 After reading all the positive user feedback on this airframe, and learning of the extensive testing and development since 2014, I contacted the airframe designer known in the quad community as ‘Daxo’ to learn more. Daxo is highly passionate about his creation and provided me with valuable knowledge and insight to move forward. Based on this research it was clear that this was the frame for me. The Atas Defiance 265 is highly innovative and in its design combining the strength of 3K Carbon Fibre at it arms and G10 FR-4 for its chassis structure. 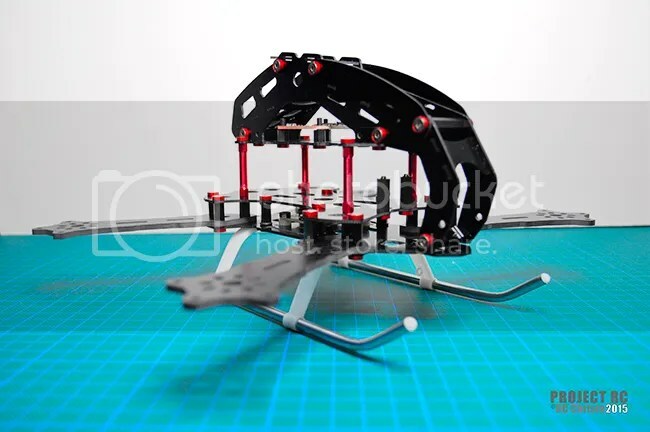 This unique airframe integrates horizontal chassis structures with vertical chassis structures utilising the strength of multiple axis configuration. The form factor was unlike anything I had seen previously with a compact and robust monocoque configuration housing all the critical systems within a protective cage. In my opinion, from an aesthetics point of view, I find it to be one of the most attractive designs in the field. 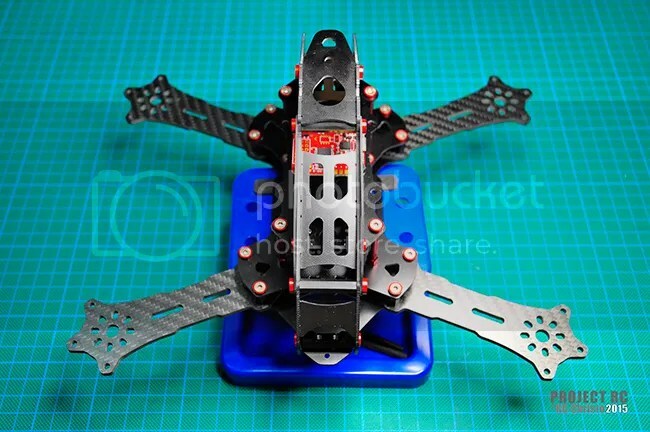 It just looks how a racing quadcopter should. 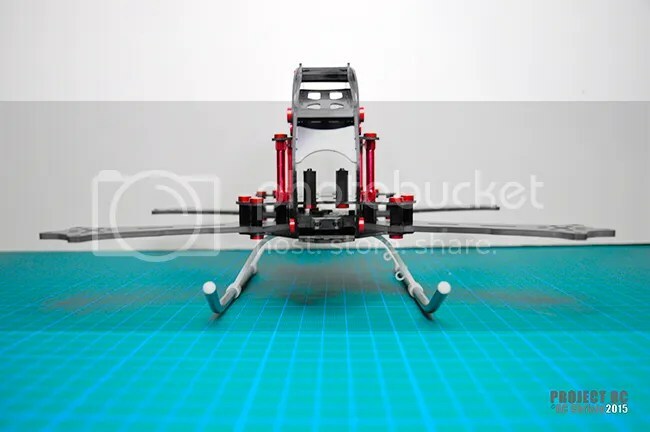 This airframe along with 95% of all the necessary components was purchased from ‘Drone Matters’ (DM) the exclusive distributer of AtasShere products. Drone Matters is a Singapore based store that specialises in muti-rotors and high quality systems and componentry. I could not be happier with my purchase from DM. With excellent and friendly customer service, Garry who is the proprietor, provided extensive knowledgeable advice and guidance when I was selecting all the components, which reassured me on my selection. Recently I received the first shipment of components from DM and began initial inspection and assembly of the Atas Defiance 265 airframe. The quality and precision of each of the components of this airframe is first class. With hours of inspection and handling I have not been able to fault it thus far. The first order of business was to ‘Mock – Up’ the assembly to determine basic fitment of the key systems such as the FC, ESC, Motors, PDB. Everything fit and mounted as was expected. Mounting points are accurately cut and the frame assembles together with a high degree of precision and structural strength. The frame comes with an ‘Endura’ upgrade which comprised of type 7076 anodised aluminium dome head screws. 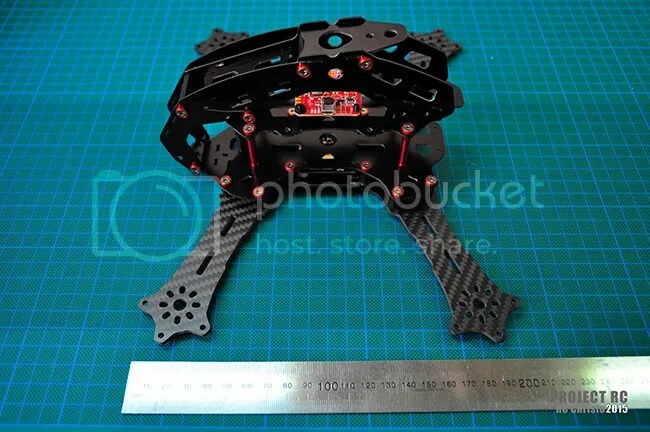 I wanted to make this airframe as strong as possible, as it is my first quad and I am anticipating a few crashes. 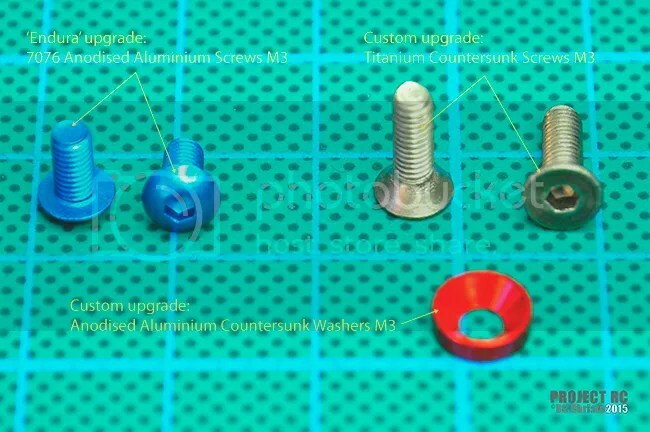 I decided to not use the aluminium screws and instead use high quality titanium countersunk screws coupled with aluminium countersunk washers. I also experimented with increasing the screw lengths by 2 – 5 mm to maximise the structural strength. 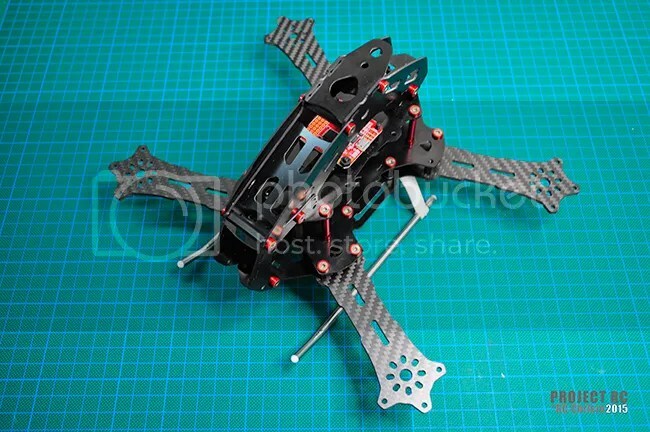 As a base stock configuration with the aluminium screws, the specified airframe weight is 173g. Interestingly the weight gain from the titanium and alloy hardware was minimal. 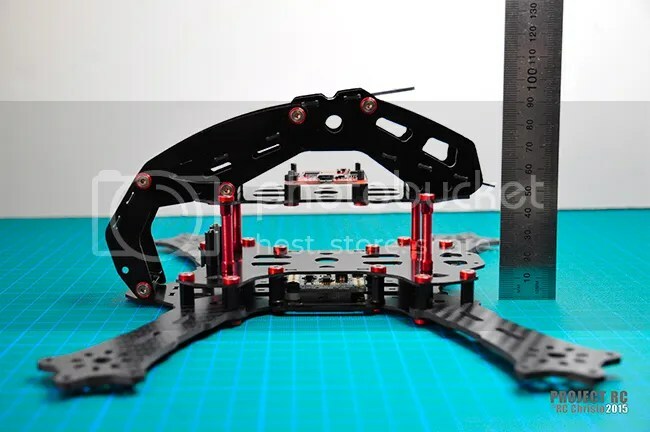 Assembled airframe only weight with new hardware is ranging from 187g to 190g depending on different screw configurations which is only 14 – 17g heavier. 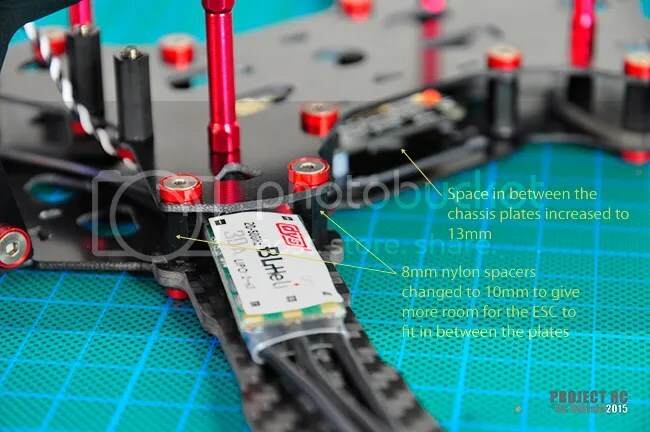 I also changed the kit nylon spacers in between the Arms/undercarriage segment and the Battery Deck Segment from 8mm to 10mm to accommodate my 30A ESC’s better. 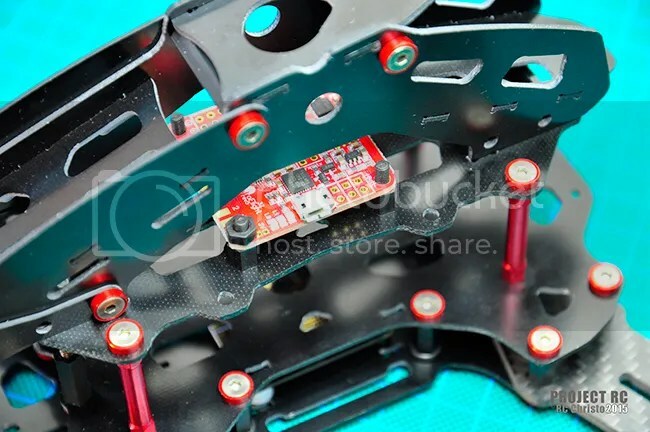 Because I raised the spacers in between the Undercarrige segment and the Battery Deck segment I found that I would not be able to use the G10 chassis support plates. But I came up with a great solution. Where the mounting holes are for the 3D printed chassis support bracket I installed four M3 x 10mm aluminium spacers with M3 x 5 x 1.5mm rubber ‘O’ rings on both ends to sandwich and compress in between the chassis plates. The thought behind this is to strengthen that region, plus add some vibration damping. By removing the plates I predict that will increase airflow to that area where the PDB sits, suggesting increased cooling. I decided to use x2 sets of the Adaptive Motor guards for each arm. One of the G10 guard plates I installed at the base of the arms to reinforce the 3 mounting tabs and to add a rounded edge to the arm ends to minimise the chance of the arm mounting tabs digging into the ground in the event of a crash. The other set I installed on top with 10mm nylon spacers in between. I was experimenting with the placement of the G10 SMA antenna holders and found that they also function really well as wiring harnesses to hold the ESC cables securely to the airframe when routing to the FC. Also experimenting with the idea to use flexible nylon landing skid arms with aluminium skid tubes for a Trex 450 Pro heli. 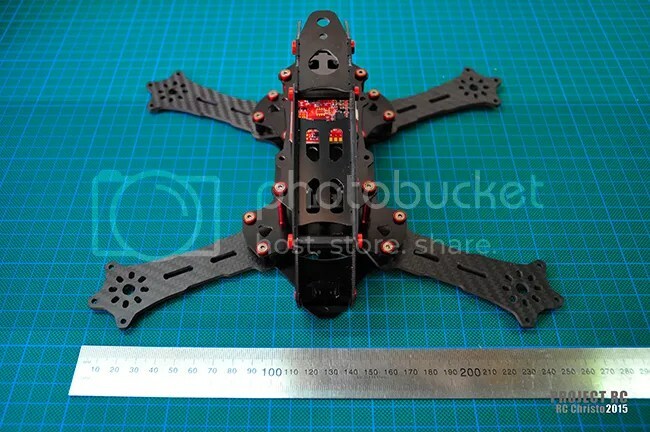 Weight is minimal at around 25g but I like to idea of having some form of flexible ground impact protection to the base of the quad, especially as I am learning. The skids are around AUD$2.50 for a complete set, so I would rather destroy these then the critical airframe components. Thank you for checking out this article. I hope it helps readers with some ideas on their next build. If you have questions or need some advice on a particular stage feel free to write a comment below and I will answer them.